VIRTUAL REALITY, FOR WHAT PURPOSE? Design, presentation, collaboration … The virtual reality will boost your know-how! Training in virtual reality: no more lesson, an experience! Reinforce your training with an innovative and pedagogic tool: a virtual reality experience. 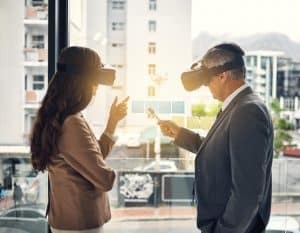 Beyond the novelty factor, the virtual reality is a proven solution to let you increase the quality, decrease the costs and time of the implementation. Being experts in virtual and augmented reality with major clients in various industries, we have categorized the application cases into 5 large families among which you will likely find your requirements. 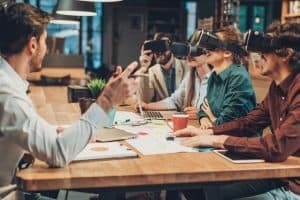 Collaborate on a project, even remotely, the virtual or augmented reality facilitate communication and decision making among all the participants. Present a concept, a prototype or a final product, virtual reality allows to share the same vision at the true scale. The design and mocking up in virtual reality allow to save time and production costs. Virtual reality speeds up and reinforces the training process. By virtually reproducing the workplace environments and situations, you save time and training costs. 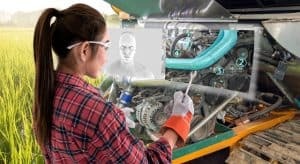 In order to accompany the worker and to facilitate his decision making directly on site, the augmented reality brings them the technical information relevant to the current context and allow to display them using the chosen device. Didn’t find the use case matching your requirements? Contact us and we will propose a solution!